The chickpea (Cicer arietinum) is a plant of the family Fabaceae (or legumes), grown in the Meditrerranean regions. It produces an edible seed, a very nutritious vegetable, similar to a pea. It is a medium-sized pea, round and bumpy, beige in color, with a pointed end. Very fragrant, it keeps its shape during cooking, which takes around an hour of boiling. It contains fat and protein, but also a number of other substances like nitrogen, starch, sugars and several mineral salts. Its cultivation is very important to the local population from an economic point of view. Cooked chickpeas, ready to be eaten. The chickpea is native to southeast Turkey, Armenia, and Syria. Various kinds of wild chickpeas still exist in these regions. Known since ancient times (3000 BC. BC), it was the first food resource in Mesopotamia (now Iraq). The nickname of the family of the Roman orator and consul Cicero (Latin cicer means "chickpea") probably comes from a wart, compared with a chickpea, one of his ancestors had on his nose. Consumption of this vegetable went on in the Middle Ages; many travelers then brought this product to Western Europe. In the world, the chickpea production is close to 9 million tons, including 6.5 million from India. The chickpeas grow very well around the Mediterranean, in countries such as Spain, Turkey, North Africa, and the south of France. 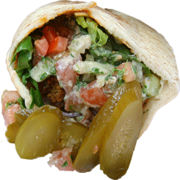 Chick peas are good for health: they are known as a remedy for digestive problems. It is the basis of many culinary specialties typical to the Mediterranean. It is found in the couscous (chickpea is called Hullar in Arabic), stews and other soups. In France in Montaren, Gard, or Rougiers in the Var, fairs are organized about the chickpea. 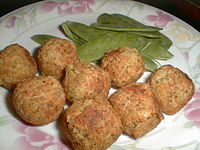 Falafels are a near-east specialty made of chickpea pellets or beans fried in oil. Hummus is a purée of chickpeas and tahini (sesame purée). Hummus from the Nile, with oil and lemon. Socca is a speciality of Nice and Menton in France. 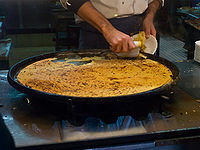 It is a large thin pancake made with chickpea flour, baked and usually sold by shares in the street. It is found in Toulon under the name cade and in Liguria (Italy), where it is called farinata. The Panisse is another Provençal and Ligurian specialty: this time, the pancake is thicker, it is first cut into small cubes, which are fried or baked. Panisses, too, are eaten "on the go", that is to say in the street. Panisses with scallions (spring onions), in Liguria. To do → Review and clean up. Review the article; clean it up and improve it yourself where you can. If you feel there is more to do, indicate what by adding the "todo" parameter to this template (add also its "date" parameter). Otherwise just remove this template from the page. This page was last edited on 21 March 2018, at 15:02.